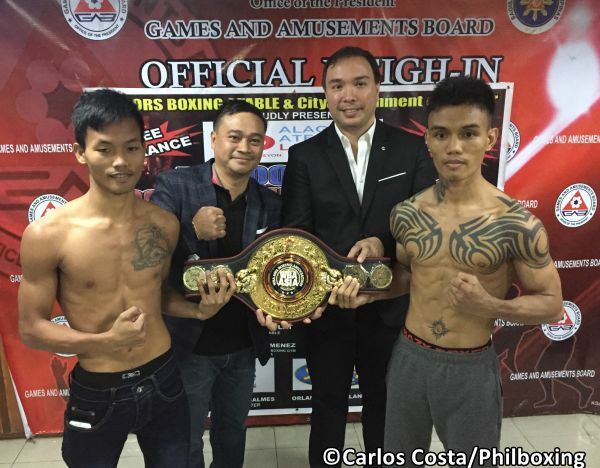 Quibors Boxing Promotions keeps on bringing excitement to fight fans in Cavite, this time staging a thrilling WBA Asia Title fight double-header Saturday (Jan 26) at the Strike Gym, located just few steps from Bacoor City Hall in flourishing Cavite. In the main event, "The Bull" Alphoe Dagayloan (11-2-5, 5 KO's), a man who can say that he went to Russia and won by knock out there, weighed-in at 112 pounds, while his opponent hard-hitting Boholano Danrick Sumabong (7-1, 6 KO's) of the Harada Boxing Stable, made 111 lbs for their 12-rounder for the vacant WBA Asia Flyweight belt. The clash is important for both, the heavy tattooed Dagayloan, 27, as well as for the tough Sumabong, 20, as an impressive win will likely to catapult the winner into the WBA world-rankings where bonus increase and great things could happen. For some boxing fans, the more accomplished "Bull" Dagayloan might seem to have an edge over the younger Sumabong. But Saumabong is a very tough nut to crack. The visiting Boholano is a man with enough TNT in his blows to rock the Bull into dreamland, making beef tapa out of him. Who will win belt and ranking? Sumabong (L) and Dagayloan pose with Chairman Mitra and Quibors Manager Orlando Borcelango today at GAB office in Makati. In the co-main feature, unbeaten 19 year-old Quibors fighter Ar Ar Andales (8-0, 1 KO) came-in two pounds heavier, but quickly sweat them out to successfully make 105 pounds ahead of his battle for the vacant WBA Asia Minimumweight Title against the taller Charlie Malupangue (7-3-3, 6 KO's) of the Cairo Sy Boxing Stable who scaled-in at 104 lbs. Malupangue (L) and Andales pose with GAB Chairman Mitra Commissioner Mario I. Masanguid and Quibors Promoter Gerry Balmes today at GAB office in Makati. 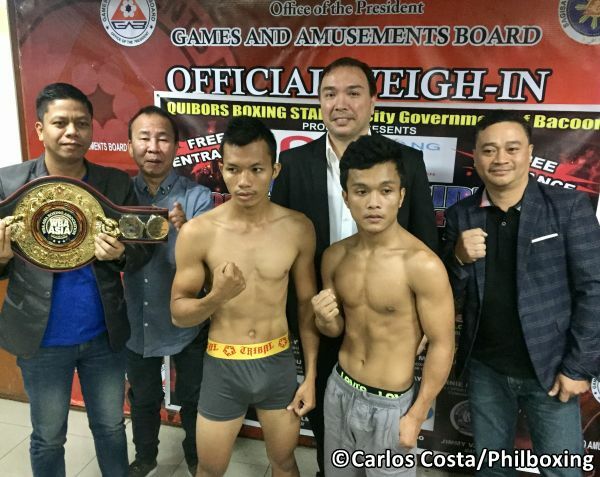 In a featherweight clash, Rustom Doronio (4-1, 3 KO's) of the Quibors Stable and Jay Lloyd Quidlat (3-0, 2 KO's) of the Visayas Boxing Stable in Iligan City both weighed-in at identical 129 lbs for their hot 6-rounder that promises total action. 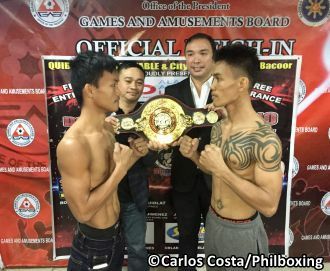 Moreover, Quibors fighter Ron Anthony Mitra (1-0-1, 1 KO) scaled-in at 116 lbs, while rookie Jun Jun Jimenez of Nueva Vizcaya weighed two pounds heavier at 118 pounds for their four-chapter bantamweight battle. The battle is Jimenez first pro fight. Plus, Jopher Marayan (7-12-2, 3 KO's) of Lipa City, Batangas, fighting out of the Quibors Gym stepped-in at 114 pounds, as Julio Bala (4-11, 2 KO's) of El Salvador, Misamis Oriental, weighed-in at 116 lbs for their six-stanza symphony of leather. In the opening bout, "Fearless" Joseph Bayubay (2-0-2, 1 KO) of Midsalip, Zamboanga del Sur, made 112 pounds, while Ernesto "Ernie" Mino Jr., of the Pili Boxing Academy in Camerines Sur registered 111 lbs ahead of their 4-rounder action combat. GAB Supervisor for the afternoon of boxing is Antonio Comia. Referees for the WBA Asia title fights are experienced third men Silvestre Abainza and Ferdinand Estrella. The WBA Asia double header at Strike Gym in Bacoor, Cavite, is a production of Quibors Boxing of promoters Joseph Quibral and Gerry Balmes. Manager Orlando Borcelango. Matchmaker is the popular Jimmy Vallares Jr.
Fights begin at 3 PM. The author Carlos Costa is a Panama-born veteran fight reporter living in Cebu. Carlos can be reached by email carlos512@hotmail.com and WhatsApp 09184538152.